Why have a waxing treatment at Therapy House? If you want your skin to look smooth and hair-free, then waxing is the longest-lasting temporary hair removal technique currently available. With this treatment, warm wax is applied to the skin and enters the hair follicle, allowing the hair to be pulled out from the root. After a waxing treatment at Therapy House, your skin should look silky smooth and completely hair free for three to six weeks. What types of waxing are available at Therapy House? At the beginning of your appointment, we will apply a pre-conditioning lotion for waxing to the treatment area. We use both hot and cool waxes, depending on the treatment area. 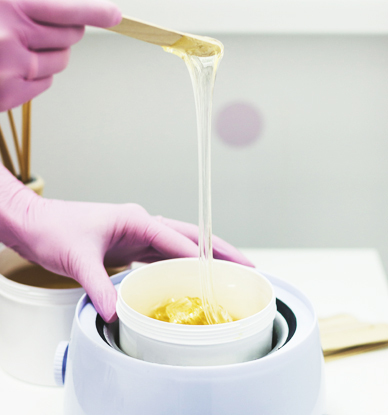 With a hot wax treatment, the heated wax is poured on to the skin and covered with strips of cloth. Once the wax hardens around each strand of hair, the cloth is quickly pulled off. Your skin will be held taut in the opposite direction from the way the strip is removed. Cool wax treatments can be more comfortable, less messy and quicker than hot wax treatments, but give the best results when used on fine hair. After waxing, hair typically grows back in three to six weeks. Waxing can be painful, especially for those with sensitive skin. The best way to reduce the pain is to try and relax! This may be easier said than done but, according to many beauty practitioners, when a client is tense the follicle closes and the wax doesn’t reach the root of the hair. Immediately after waxing it may help to apply gentle pressure to the area with your hands; icing the area can also help to ease the pain. The more often you get a wax treatment, the more accustomed you’ll grow to the experience and the more pleasant it will become. Waxing should be avoided if you have a contagious skin condition, or cuts or grazes to the area requiring waxing. It is also not recommended if you have skin allergies or thin, fragile skin. Steroid medication can thin the skin, so do not wax for three months after your medication course is complete, or six months if taking the acne treatment, Roaccutane. You may also be advised to avoid waxing in areas with raised moles and skin tags, bites, bruises or varicose veins. Are there any other longer-term hair removal options? A longer-term alternative to waxing is our virtually pain-free Soprano XL laser hair removal system which can leave you with hair free smooth skin and permanently reduce your future hair growth in the treatment area. Want to know more about Waxing?